This quote by Wayne Dyer haunts me. It first appeared in my social media feed several years ago after a friend became homeless. Rather than search frantically for another minimum wage job, she chose to move into and start selling jewelry from her van. I was horrified. She, on the other hand, was strangely content. Instead of bemoaning her situation, she kept her focus on three goals: make and sell jewelry, meet and help good people, and find ways to overcome her health challenges. At first, I was indignant and hurt. I was the same person I’d always been — the one working 50 or 60 hours a week to keep my business afloat — the one who was now devoting every waking moment to finding a job. But that didn’t seem to matter. It was as if I had become a pariah, a symbol of something they found pitiable or distasteful. Then it hit me. They were afraid. I was living their own worst nightmare, and they couldn’t get away from me fast enough. I guess I don’t have to tell you he made my day as well. For me, there is nothing better than the love of a child. It’s why I do what I do; why I am so determined to give them the chance to find and celebrate what makes them each perfectly not perfect. I hope you will grab a copy of The Not Perfect Hat Club and let it speak to you as well. Step into my world and take down the walls between us. Work and play hard, but give your heart and mind time to rest. Whisker Wisdom for Saturday, August 27, 2016. Jump in a swimming pool, sink to the bottom and look up at the sky. I must have listened to twelve-year-old Beau Dermott sing, “I’m through with playing by the rules of someone else’s game,” (from Wicked) a dozen times now, and each time the power of her words and voice take my breath away. In them I hear not only echoes of my own attempts to defy gravity, but a reminder of what is at stake if we continue to accept the rules and limitations of an education system that is focused on corporate profits rather than what is best for our kids. So where do we begin? We begin by asking – by making our beliefs, concerns and values as trained professionals known to those who hold the purse strings. We enlist the aid of our students, who after all should have a say in what and how they learn, and need opportunities to create presentations, write persuasive letters, and practice the research and math skills needed to hire and pay for programs. We create and sign petitions, write to our government officials, speak to our PTAs, parents, boards of education and community organizations. We join and take an active role in Edcamps, conferences and organizations that are committed to effective change. We rock the boat and make waves. Finally, we keep challenging, questioning and supporting one another. We refuse to see others’ abilities as threats to our own. We share what we learn and celebrate what our colleagues accomplish because we realize one person’s success benefits us all – that we each have something unique and valuable to bring to the table and are indeed better together. Make no mistake, the revolution that’s needed cannot be accomplished by a few souls working in isolation. The kind of change we’re talking about will require an army of committed, caring educators who believe that our future depends on giving all children the gravity defying tools they need to fly. Able to Leap Tall Buildings! Becoming a character in a book you’ve written is a bit like discovering an alter ego. It starts with how you dress and speak, but quickly becomes another way of seeing and being in the world. At this point, I don’t just change into Ms. Jenaia’s baggy overalls, work boots and floppy green hat, I step into her personality – adopting her outgoing, upbeat attitude and commitment to making the world a better place for canines and kids. For those who haven’t met her, Ms. Jenaia is one of the main characters in all the CritterKin books. A former teacher turned dog trainer, she makes her living teaching people and their dogs how to communicate. She is a champion of those who are misunderstood or a little bit different, determined to discover what is really going on beneath a dog’s unruly behavior or a child’s unexplained tears. She likes nothing more than a challenge, and works with good-natured tenacity on projects like helping people overcome their fear of pit bulls, finding new homes for abandoned dogs, and teaching teamwork and self-confidence by starting flyball teams. To say that Ms. Jenaia is a character is an understatement, but over time I have discovered that she is the expression of the best and brightest parts of me. Here’s the thing. It’s not that I think I’m special, it’s that I know I am unique. There’s a big difference. Special implies a hierarchy of entitlement. Unique simply acknowledges that I have a piece of our collective puzzle that no one else can provide. If that’s the case, then why waste time comparing, judging, testing and competing? Why not help each person find, develop and apply his/her unique abilities to the world’s problems? Why not teach our children that learning, like life, is an iterative process, and to be fearless in the face of failure? In fact, why call errors, experiments gone awry and unexpected outcomes failures at all? No experience in life is a failure unless we fail to learn and grow from it. But back to Ms. Jenaia. Each and every time I step into Ms. Jenaia’s personality and clothes for a visit with kids; every time I shout, “helllloooo,” teach them to draw a dog, or ask them to share what makes them wonderfully imperfect , I am committing an act of courage, hope and defiance. Courage because it takes guts to drop the polite, professional roles we’re taught to adopt in order to be “acceptable,” and dare to be creative, goofy and spontaneous. Hope because I believe that the solutions to many of the world’s problems lie in our willingness to be more creative, goofy and spontaneous – to get out from behind our podiums to learn with and from our kids. And defiance because I am daring to question the status quo. My little book, The Not Perfect Hat Club may seem like just a charming, entertaining read, but make no mistake about it. The messages in the book – no one is perfect; your job is not to pass tests, but discover what makes you unique; winning is about more than crossing the finish line first – run counter to what is being taught and experienced in most schools today. Standardized tests and curriculums that require all kids to learn the same things in the same way on the same schedule instill fear and intolerance. In an era when 65% of the jobs our children will hold have not yet been invented, and employers are looking to hire young people who are creative, adaptable, innovative and collaborative, doesn’t this seem a little ridiculous? Courage, hope and defiance. I think about these words more and more each day – as I pull Ms. Jenaia’s overalls out of the closet to dress for a reading; as I eavesdrop on three frustrated teachers at Starbucks who say they’re so busy testing they don’t have time to teach; and as I put on what I fondly refer to as my “Clark Kent duds” to interview for one of those “real” jobs. I wonder how my prospective employers would react if they knew who they were really interviewing – if I suddenly leapt to my feet, ran to a telephone booth and emerged wearing Ms Jenaia’s signature floppy hat and carrying poop bags. Would they still frown over my resume, call me “dear,” and tell me I’m a little over qualified for the position they have open? The funny thing is, I’m all but positive something like this is going to happen soon. Not the presto chango thing with the telephone booth, but the discovery of my alter ego and her like-minded counterparts in schools and classrooms around the world. On the surface of things we may look mild-mannered and unassuming. We may speak softly and do our best to cope with the increasing demands on our time, but when it comes to our kids we are fearless. Look for us in staff meetings and at parent-teacher nights, in virtual classrooms, Edcamps and global read alouds. Find and connect with us on Twitter, Facebook, Pinterest, Instagram and professional forums. We’ll be the ones who can’t contain our passion for teaching and new ideas, the ones urging and empowering our kids to leap tall buildings with a single bound, because we believe anything is possible with courage, hope and a little bit of defiance. This Wednesday, September 23rd I had the good fortune to be invited to share my new book, The Not Perfect Hat Club, with the 600+ students at Pine Valley Elementary School in Wilmington, NC plus an additional 15 classes from five countries around the world. I read, fielded questions, signed books and had held some Not Perfect Hat Club drawing and discussion sessions with 2nd. 3rd and 4th. graders. The kids knocked my socks off with their honesty, insights and creativity, proving yet again that given the chance they’ll shine. But the most wonderful moment of all occurred almost 24 hours after my visit. It arrived via Twitter and was posted by the grandmother of the little boy in the picture above. “Mason fell asleep last night with his treasured signed book!” said Amy Riggs. The book he is holding close to his heart is the The Not Perfect Hat Club. There’s no greater compliment for a writer than the love of a child, and in this case it was doubly sweet because I had met and chatted with Mason during my visit to Pine Valley. It was also a reminder that the message I am sharing in The Not Perfect Hat Club is one that children respond to and need to hear. 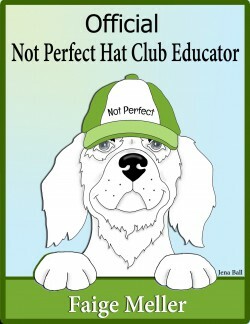 I hope you will all read The Not Perfect Hat Club and share its message with your family and friends. Let’s help raise a generation of kids who understand that there is no such thing as perfect, but each and every one of us has something special to share with the world. The introverts, ready to observe. The extroverts, eager to be heard. The ones waiting for their turn. Too squirmy to be still. When none is to be had. By pure happenstance I came across a conversation on Twitter about The Not Perfect Hat Club and sat mesmerized, reading the tweets. But, being me, I quickly joined in with questions and comments. I loved the idea of silly hats and posted pictures of me and my get-ups. I write this post to share with all of you a book that be a wonderful addition in every school and classroom library. Hope you get a chance to read it and explore it with your students.